Sept. 9 through Sept. 15 is National Suicide Prevention Week, and Lost and Found and the Cook House are organizing a variety of activities to raise awareness about mental illness and suicide. 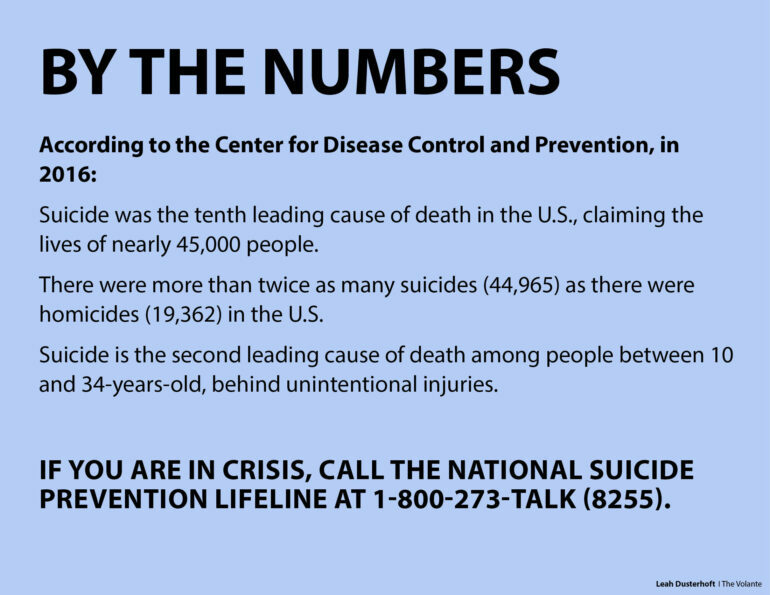 According to the National Institute of Mental Health, suicide was the tenth leading cause of death overall and the second leading cause of death for people between the ages of 15-24 in the U.S. in 2016. Lost and Found is an organization on campus whose goal is to “build resilient people in hopes to prevent suicide.” They offer a place for students to learn positive coping methods and form bonds with other students so they have a place to go if they need help with a mental illness. Rebecca Earl, junior social work major and director of membership and recruitment for Lost and Found said their bi-weekly meetings are focused on giving students time to talk and relax as well as participate in activities. Earl said that while they are a good support system on campus, students should still see the counseling center at the Cook House if they have any issue they want to discuss. Ben Severson, prevention coordinator for the Cook House said they’re doing sidewalk art to raise awareness for the event. The Cook House is located at the corner of Willow Street and Clark Street, and Severson said the doors are always open to students who need help. Both Lost and Found and the Cook House have tables in the Muenster University Center during National Suicide Prevention Week. The Cook House is open from 8 a.m. to 5 p.m. Monday through Friday all year round and are available at 605-677-5777.